Morning girls. Well as we know Doilies are really in at the moment but some of my layouts are looking like a tea party with a bunch of blue rinsed ladies, so I felt like I needed to "dirty" them up a bit. This is where your faithful old Modge Podge and an ink pad comes in. First I lay my doily on my cardstock where I wanted the image then generously applied Modge Podge over the doily paying particular attention to getting the medium within all the little cut out bits. Be generous with the amount you use. I also took my paint brush just around the edge of the doily to create a clean image. 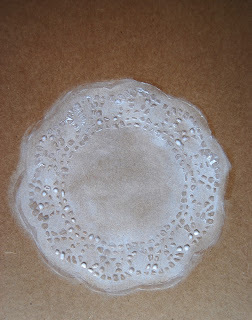 Peel the doily off the cardstock carefully whilst the Modge Podge is still wet and you will have an image like this. It is very important to wait until the Modge Podge is fully set! Once dried, and I mean DRIED, rub your ink pad over the image. For mine I used a white ink pad which was nearly on its way out so I could really work into shading etc. Once done, use a wet wipe and rub lightly over your image where the Modge Podge is and as the ink won't adhere to the Modge Podge it will wipe away leaving a positive image and yet you can manipulate it to how you want using different coloured inks or paints. 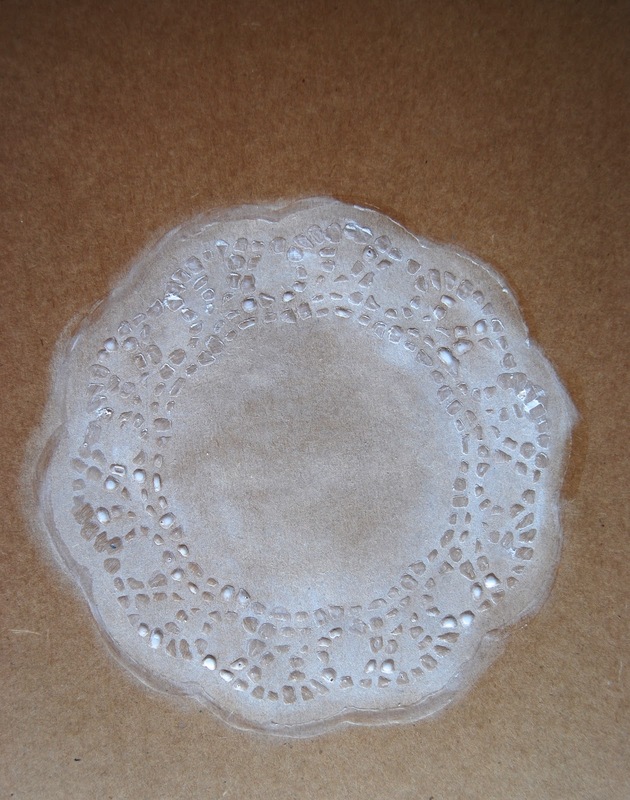 I then inked the rest of my card stock to add shading and to make the doily look as though it was part of the paper. This could look great on Heritage layouts using vintage colors. Products Used: My Minds Eye Blossom paper, My Minds Eye Meadow paper, My Minds Eye Everyday paper, Bazzill Kraft, Crate paper Little Boy Blue Veneer Shapes.